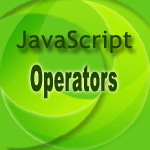 The in operator is used to check whether a given property is available on an object. property: Name of the property. object: Name of the object. The following web document shows how the in operator is used. See the Pen in-1 by w3resource (@w3resource) on CodePen.